My daughter inspired me to start my weight loss journey because I want to be a good and healthy role model for her. I try to keep her active by taking her on walks, taking her to the park and just running around with her in the house. I was super excited when I heard about the Move & Groove Game from ThinkFun, Inc. It is super easy and super fun to play for adults, kids and toddlers. I say adults because I had such a fun time playing with my little toddler. You get a big plush cube with different colors on each side and a deck of cards. Each card has a color and an image and text of a different dance move. You roll the plush dice and draw a card of that color and follow that dance move. You get 48 cards with different moves such as air guitar or the funky chicken dance. At first my daughter just loved playing with the plush cube and saying the colors out loud. Then I showed her how to play it and she laughed at how silly I looked. She even got my husband involved when she went up to him with the cube and said "Dada dance". I highly recommend this game if you have a toddler or young child. 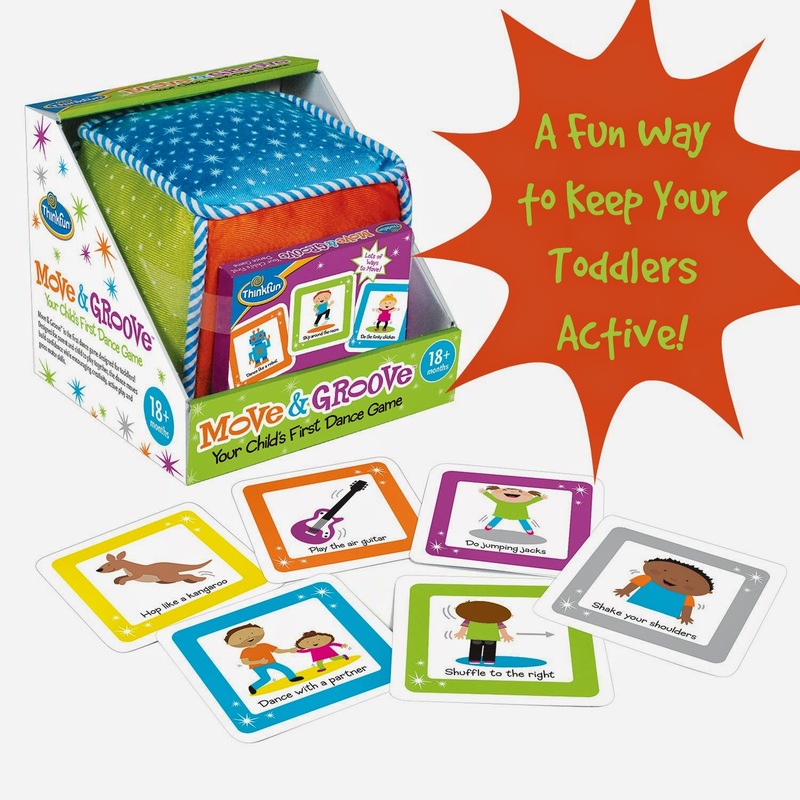 It is a fun way to get your child active and interact with them. I remember using similar toys with my daughter. Spending time together bonding while getting them active is amazing. I am also encouraging my mom to lose weight through dancing. It's fun to be creative as there's many ways of losing those excess fats. Aww-that sounds like a really fun way to interact with your little one! Yes, I love this game. You can't be sad and dance. Dance away the pounds and dance to happiness. Great childhood memories too. Now that's a neat idea right there and these days it's kinda important! what a fun game! And, it could sooo easily include anyone! ThinkFun makes such good games. I think my kids could even ahve fun with this! So cute! My family would love this game! The Move & Groove sounds great! My daughter would have loved this when she was younger. Great idea as a gift though for some birthdays coming up! How cute! I know that I was inspired to start my journey because of my son. I found I was getting out of breath just trying to run and keep up with him. These sure look fun, and I love that you are modeling health and fitness for your daughter, but above all, you are modeling courage and persistence, which are values that will last a lifetime. You're wonderful! This is a really fun and educational game for toddlers. This is something they can relate to and enjoy. I always love seeing your posts because you show great products for toddlers which I have 2 of!!! My son loves dancing and would love this game. Thanks for sharing! That looks like a great way to get the kids moving... thanks for sharing..
What a darling game! My two nephews would love this! Looks like a great game a nice way to get your toddler moving--super boredom buster too!! Looks like a fun game. I wish it would have been around when my boys were little. This definitely looks like something that would be great for those who have small children at home. Awesome idea and such a fun activity! Nice post. Good for baby's and it's one of the best bonding time with the kids. We have this, my 3 year old son LOVES to play this, he has a blast and is learning at the same time! Getting a toddler to pay attention can be difficult but I know my son liked flash cards at this age and I think he would have loved this. looks like a blast. I lost 130 pounds so i could be a better mom. I was blessed with a second child after I lost all the weight. So glad I did as I may not have had her without the weight loss. We got one of these for review too, and my daughter squealed in delight;) We had a good time playing as a family! These look so cute and fun. My toddler demands to be called a big kid lol. But he would love something like this. My lil nephew and niece who I will see tomorrow would love these thanks for sharing. My youngest might not be able to have fun with these. This would be great in a preschool! Luv the bright colors! I can picture lots of giggles with this game. It sounds super cute! This kind of interactive amusements for kids must be brought back today because people lose bonding to the person near with them and develop from other far from them because of the modern technology. This kind of games must be introduced again to the generations today. Wow, very interactive and at the same way, a good game toy to have fun and make recreational activities. I find this cute too.! This is pretty cool, I'll have to look for this for the younger kids, they will definitely like this. Wow what a great game. My little guy would LOVE this. This looks really fun! Have to check it out and I'm sure my daughter would love it! What a great game! I love the idea for so much fun with the kids! Looks like a cute game that entertains the whole family! I think my daughter would love this game too! She loves saying her colors! What A Adorable Game I Bet It Keeps The Little Ones Busy For Hours!